Tales From The Darkside “Halloween Candy” (1985) | Dir. Tom Savini | 22 min. The Halloween Scrooge is a perennial classic. From Trick ‘r Treat to Beyond Belief: Fact or Fiction, everybody’s getting in on the old codger who won’t give trick or treaters any candy. My favorite take on the concept is this creepy Tales from the Darkside episode which seemed pretty appropriate for our last post. Expertly paced and jarringly edited, director Tom Savini proves he’s not just an FX whiz but a damn calculating director too. 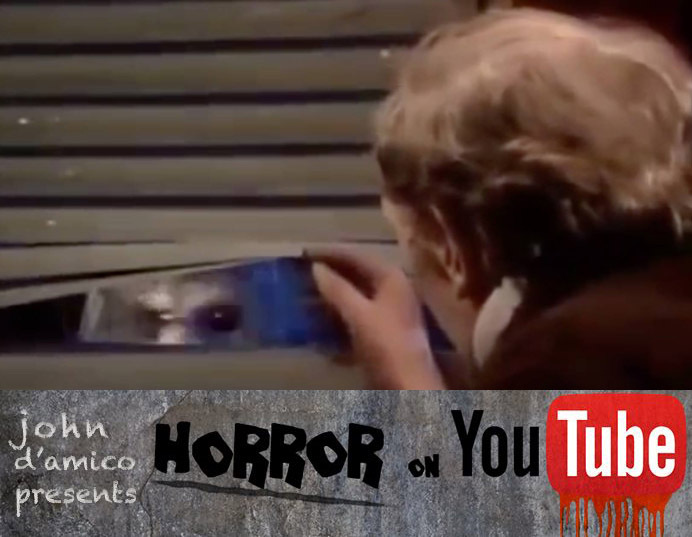 It’s a tingly little creepshow with a surprisingly deep reservoir of suspense and goopy makeup effects. Take it as a warning: Tread carefully on Halloween night, because you never know who—or what—is game for a trick. Hop on board for one of my favorite public domain horror movies, in which implacable movie enemies Christopher Lee and Peter Cushing finally get to team up as they hunt for a psychic caveman on the Trans-Siberian Railroad. Great practical effects in this TV movie about, you guessed it, Gargoyles. Weirdo tracks Bigfoot in a pseudo-science documentary that’s basically a real life Troy McClure film. Karloff leads a team of thieves who stole from a haunted idol. Famous Route 66 Halloween special uniting Boris Karloff, Peter Lorre, and Lon Chaney Jr. for the last time, playing themselves at a horror convention in Chicago. This is hilarious but also freaks me out every time I get into an elevator alone. Thanks for this great series, I really enjoyed having an advent calendar of horror to look forward to each day. If you are looking for more youtube horror I’d like to recommend Kali the Little Vampire. It’s only 10 minutes long but it’s really beautiful and uncanny.